According to Larry Wall laziness is one of the 3 virtues of a programmer, because it makes you document what you wrote so you don't have to answer so many questions about it. While commit messages may not become part of the user facing documentation, they certainly are an important part of documenting development, especially when you work with other people. 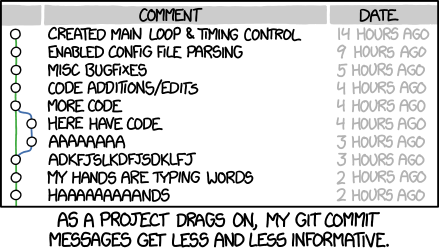 Usually, I want to add or remove files from source code management, when I added or removed them from a project, but I tend to forget running git add .. But more importantly when I run gac an editor is opened to write my commit message. Before, I simply wrote them directly on the command line being rather sloppy about spelling and grammar and sometimes just repeating previous messages by "abusing" command history. With this little hack I get a shortcut for a longer command, I cannot simply repeat a previous message and just having an editor open makes me reason more about what I want to write, which is probably the most important part of it. If you write your commit messages directly on the command line, give it a try to see if they get better. Let me know how it worked for you and feel free to share your method of ensuring good commit practices in the comments below. This post was written by Ramiro Gómez (@yaph) and published on May 20, 2015 . Subscribe to the Geeksta RSS feed to be informed about new posts.